Ever thought of just relaxing and enjoying nature to the fullest extent, while having a beer on the boat and letting the fish finder do all the work? It sounds quite relaxing and sometimes even impossible, but with the right fish finder, this can certainly become quite the habit and an extraordinary way for you to break away from the rush of the city. The Lowrance HOOK-7 combines the luxury of top features found in the HOOK-9 and gives you a slightly smaller screen and a more affordable price. Stacked with features like a CHIRP sonar and DownScan imaging, missing any potential big catch becomes virtually impossible and while you are relaxing, the alarms will notify you immediately when something is detected. The Lowrance HOOK-7 features a CHIRP sonar with DownScan imaging and this is available at multiple different frequencies. These frequencies are 83/200 kHz for the CHIRP sonar and the DownScan imaging can be alternated between 455 and 800 kHz. Additionally, the CHIRP sonar has a maximum depth capability of 1000-feet, while the DownScan sonar is a little less at only 300-feet. Since it does not have an Ice machine upgrade package, the transducer has all the abilities found in the Ice Machine upgrades of the smaller HOOK fish finders. The sonar is also compatible with the transducers found on many other brands. Finally, the sonar includes a TrackBack feature, allowing the user to review the sonar detection and see if they might have missed any potential fish or for just reviewing the bottom of the lake for any objects that should be avoided. The Lowrance HOOK-7 features a 7-inch backlit display. The backlight feature has been included to help the individual see the screen clearly when the sun is beaming down on the display. It can be toggled on and off if needed for nighttime fishing as well. The display features an 800 x 480-pixel matrix capable of displaying even the faintest of objects found in at the bottom of the river. Additionally, it comes with a multi-window display, allowing the user to view several different screens simultaneously or simply just sticking to the main screen with the important stats like the depth and the water temperature. Fish are not indicated as arches, but rather are icons of various sizes, giving an indication of the size. Anglers always rave about the importance of having a decent fish finder and the HOOK-7 is equipped with a highly sensitive GPS antenna, it also features 16 internal channels and allows the user to plot up to 3000 waypoints while saving multiple hotspot locations for future reference. It comes with over 3000 locations already built in, but users will have the option of upgrading it and expanding their fishing libraries by purchasing additional maps of rivers and lakes. Further, the user has access to the Insight Genesis technology, allowing you to create custom maps of your favorite locations and storing these for future use. The Global chart upgrades available for purchase include the US Navionics+ and Jeppesen C-MAP MAX_N maps. Advanced Signal Processing allows the system to automatically adjust the settings as the fish finder is tracking different stats and collects data; this keeps you from constantly fiddling with the settings as you are fishing or driving the boat. The diagonal display system also makes it possible to operate the fish finder with just one finger while casting or steering your boat. It also contours the bottom of the lake and allows the detection system to spot any potentially hazardous objects that might not be best for your boat to drive through. Learn more about the HOOK series from Lowrance.. The Lowrance HOOK-7 and 7x are designed to last. These fish finders are basically impervious to the weather conditions and they have a waterproof rating of IPX7. This enables you to fish in wet weather conditions and the fish finder has the ability to last around 30 minutes in 1-meter deep water. The one-hander design makes it easier to navigate through the settings and display features and the 7-inch display ensures the user will not miss anything. Compared to the large size of the HOOK-9, the HOOK-7 is slightly smaller and makes it easier to carry if needed. It comes with a mounting bracket and can be removed from this bracket if needed when not in use. The addition of a functional backlight allows you to go fishing in virtually any weather condition, providing great versatility. The performance is what defines a product and the Lowrance HOOK-7 is extremely functional and versatile. The transducer is much better than one would find on the smaller HOOK-5 and instead of upgrading to an ice-resistant transducer, this one is already ideal for cold weather conditions. The multiple frequencies it offers makes the fish finder ideal for more than just casting into deep water, it can also be adjusted for dropshotting. However, the only flaw is the lack of internet and the ability to share locations and hotspots. 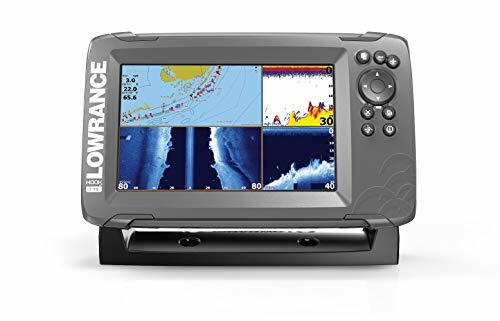 In today’s modern world, everything is linked to the internet and communication, but the Lowrance HOOK series has completely missed out on this trend and this needs to be included in future products or even upgrades. One of the prominently good features of the Lowrance HOOK series is the GPS and the mapping capabilities. The HOOK-7 continues this trend with the same GPS system and capabilities as the top fishfinders on the market today. It enables the User to plot around 3000 waypoints while containing charts and maps of over 3000 US lakes and rivers. This feature is great for the traveling angler and eliminates the need to constantly download new maps. It is also worth mentioning that the antenna is highly sensitive and we found it to be extremely accurate. The HOOK-7 fits snug in the middle of the product line. The fish finder has all the features of the top fish finder but does not cost as much as the bigger brands. The HOOK-7x is a little cheaper and since it does not have GPS capabilities, it is made for fishing at your local lakes and rivers that you know the locations and hotspots off. Price wise, the Lowrance HOOK-7 closely competes with the HOOK-9 and while it is a little cheaper, the smarter decision might be to get the extra 2-inches on the screen. The designs are quite similar and they have many of the same features like CHIRP sonar and DownScan Imaging. 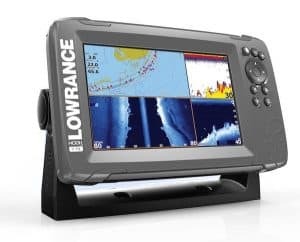 The Lowrance HOOK-9 is designed on the same base as the HOOK-7, it includes many of the same features, but many people might prefer a bigger screen to read the display a little better. With over 3000 different maps and the ability to expand the library, this might potentially be a worthy investment if you have the funds. See our Lowrance HOOK-9 review. With a similar design, the Humminbird HELIX 7 CHIRP SI GPS G2 can also be operated with just one hand. It also includes a CHIRP sonar with multiple frequencies and the massive 4000 watts PTP power output makes it great at detecting any and all objects. While it is around the same price as the HOOK-7, it does only have a 5-inch display. If the display is not your main concern, this will be a great option. See our Humminbird HELIX 5 review. With so many top models, it can be quite a strenuous process to find the right fish finder that meets your needs, but Lowrance has made strides in providing users with a multifunctional fish finder that meets most of the basic needs. While it does not have internet capabilities, it is great at doing its job and this means that it will certainly help you catch those elusive fish. Fishing Tech happily gives the Lowrance HOOK-7 and HOOK-7x a B rating and we hope that the inclusion of internet access is something they do include in the future models. However, this fish finder is definitely recommended for intermediate to advanced anglers.